Are you sure TATA Boost Purification Kit 3000 L Gravity Based Water Purifier is not available in market? 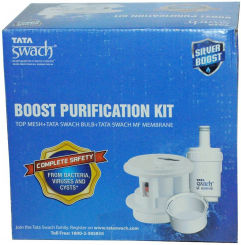 TATA Boost Purification Kit 3000 L Gravity Based Water Purifier from Tata is listed in Water Purifiers category in revaalo. Reviews,Ratings, details and specifications of TATA Boost Purification Kit 3000 L Gravity Based Water Purifier. 4. It is suitable for tata swatch silver boost 27 litre filter. Even i have faced the same problem. Its not at all worth buyin.g. Average product.! Very bad product Tata service is a very chip. His purification kit not available at any location.gravity kit not available at any location Tata have to improve this chip service. Great product with very affordable price! and works really brilliant. Initially i thought it wont work much, but it worked really well. Good purifier with perfect performance and better water taste.